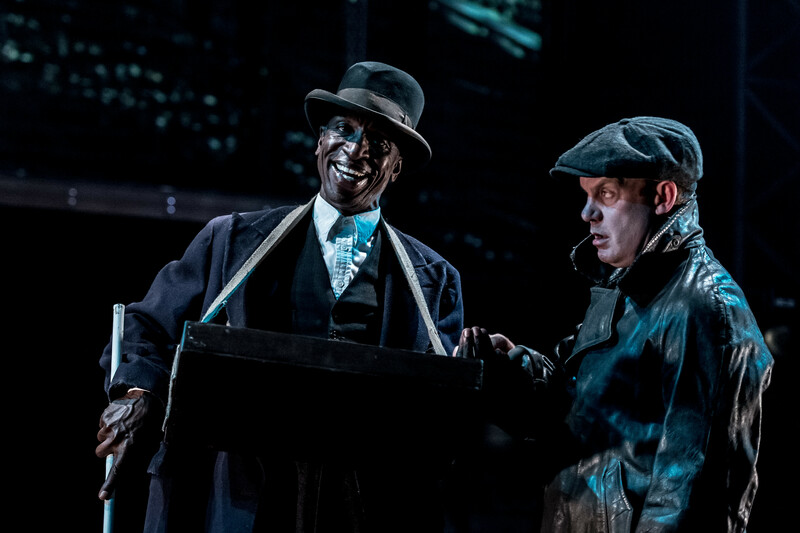 A new stage adaptation of an Arthur Miller screenplay ‘The Hook’ that was censored by Hollywood in the 1950s has seen its world premiere in Northampton in a version by Ron Hutchinson. Connellan’s brooding set, thanks to clever use of Nina Dunn’s projections and Charles Balfour’s moody lighting, is dockyards, streets, offices and homes, allowing all the cross-cutting demanded by the filmic element of the script. There is more than a nod here to film noir and the strictures of black and white lighting. The play, co-produced by Royal & Derngate and The Everyman Theatre, Liverpool and directed by James Dacre, features Nina Dunn’s projections throughout. 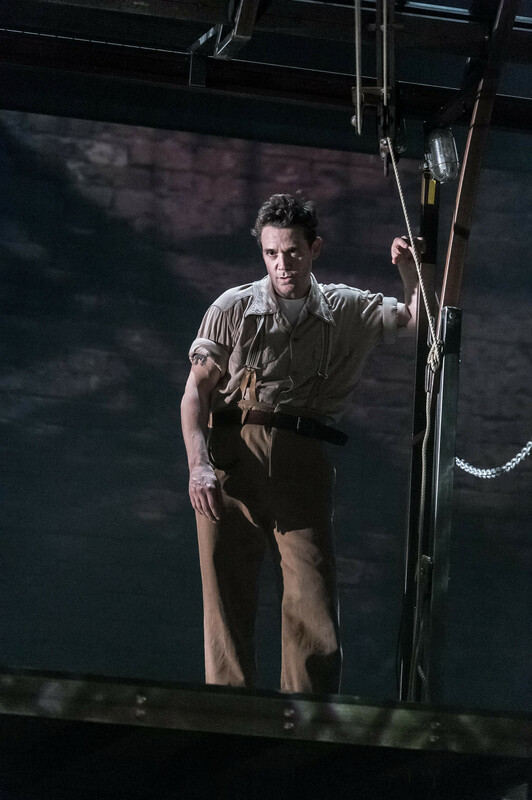 True to her usual form, the deft and seamless integration of her projected designs with both Patrick Connellan’s masterful set and Charles Balfour’s lighting makes for a rich and atmospheric whole where it is often hard to discern the elements from each other. The projections also facilitate split second scene changes between docks, street, union hall and Brooklyn tenements lending the whole a pacy, filmic quality. Added to the visual feast is an enveloping sound design by Tom Mills with filmic underscore and original composition by Isobel Waller-Bridge as well as deeply rhythmic movement direction by Struan Leslie. Following its Northampton run, the show will transfer to the Liverpool Everyman Theatre where Joshua Pharo will realise the design. The rig consists of 5 Panasonic projectors achieving full stage coverage from front, rear and the sides including two that cast their beams across the stage to bathe the ensemble in atmospheric shadows as they walk the streets of Brooklyn. The outputs are run from two MacPro Media servers running Qlab 3.